The Food Show is an event I look forward to every year. I was grateful to attend the preview day again this year and meet so many passionate New Zealand foodies making such amazing and innovative products. 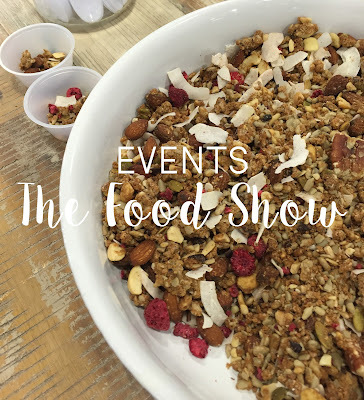 Here is a round up of my favourites from the 2016 Food Show. This was the first thing I tasted as we started our day and they are so delicious! They're like mini round burger buns that have been toasted with garlic and parsley. You could add so many different toppings to these or they are really tasty on their own. My family all loved these! My family all love Aloe Juice so I was thrilled to come across this new range. Their range included Rejuva Original which is 41% aloe vera juice, where some supermarket brands are only 8%, Rejuva Light which is still 41% aloe vera but with 50% less sugar and Rejuva Sparkling which 33% aloe vera, pulp free and delicious. Available at Pak N' Save and New World. I'm going to be making the switch to this brand. Loved it. I love real butter and this butter is the real deal! New to the range, this artisan butter is made by hand in small batches from locally sourced cream and sea salt crystals. This one is going to be a little difficult to track down in stores because of the painstaking made by hand process used to create this wee golden gem. But if you do see some, grab it. Hot toast with butter will never be the same again! These were delicious! Handmade dumplings made by the Dumpling Queen herself, Vicky Ha. I sampled the Cantonese Free Range Chicken and Coriander which is an old family recipes of Vicky's and it was incredible! Speaking with Vicky, she is incredibly passionate about her product and sourcing the absolute best natural ingredients﻿. And you can tell because the finished product in amazing. Available from Farro and Nosh. New to the Ghiotti range is there incredible gelato which will soon be available in take home tubs. I tried a traditional buttery vanilla which was amazing. I'll definitely be keeping my eyes open for these in my frozen section. I've got right in to granola since I became obsessed with smoothie bowls. The Might Food Kitchen Granola is incredible. 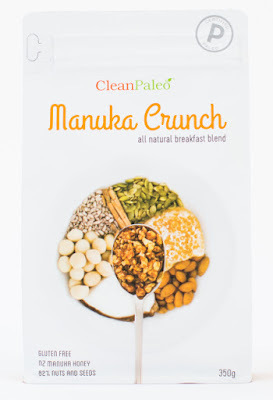 I samples their Coconut & Cacao Granola and it was beautiful. It's also paleo friendly as well as dairy, refined sugar and grain free too. A very healthy and tasty option. Delicious! I've been a fan of Pitango for years. I always loved having their risottos and soups on hand in the fridge when my girls were babies so I knew I could count on a hot, nourishing and easy lunch. They've just expanded their range to include Meal Pots and they are gooood! Available in beetroot risotto, miso chicken and chorizto chicken. I bought one of each and they have been so handy to have in the fridge when I am time poor. They are so hearty and filling. I've got to remember to keep stocked up on this brand. Love it! These were really moreish! A guilt free snack to increase your vegetable intake as there is half a head of broccoli in each bag. Free from any nasties and gluten free too. Available in salted, bbq or spicy. Spicy was definitely my favourite. Yes, that is black water! Sourced from Canada, blk. water contains 77 trace minerals including fulvic which gives the water it's naturally black appearance. We expected there to be some sort of taste when we sampled it but there was none. Just crystal black water. High in electrolytes with no carbs, calories or sugar. Probably the most different and unusual product I saw but definitely interesting. For anyone with children who are fussy eaters or won't eat any vegetables then this one might be for you. Smugglers are a new take on "nuggets". Available in free range chicken with 30% cauliflower and New Zealand beef with hidden pumpkin, carrot and chickpeas. Both a lightly coated with panko breadcrumbs. Simply bake for 15 minutes and serve. Real ingredients with smuggled goodness. See if your fussy eater can tell? The owner of this company is extremely passionate about creating delicious, nutritious chocolate as nature intended. It was really interesting hearing the whole process from raw cacao bean to the finished product. And of course the product was delicious. Cane sugar, nut, gluten and dairy free. I definitely recommend this range. I love Mexican food and these raw Mexican Sundried Tomato crackers with fresh guacamole were absolutely incredible! I could have sat and eaten these all day long. Needless to say that a packet of these came home with me - and they didn't last long! Also available in Flax & Almond. I'm a big fan of seeds on my salads. Such a great idea to roast them with different flavourings and for time poor people like me these Crow About Roasted Seed Mixes are ideal to add a wee kick of flavour. The mild garlic was delish! A favourite from last year was Pixie Party Supplies and while I am trying to feature different brands from last years round up blog post, I had to show some of the beautiful things they had in stock. Meri Meri have outdone themselves this year with their beautiful liberty print range plus all the blush pinks, golds and coppers. And I just adore those plastic swans! So tempted to get them to float in the pool this summer!